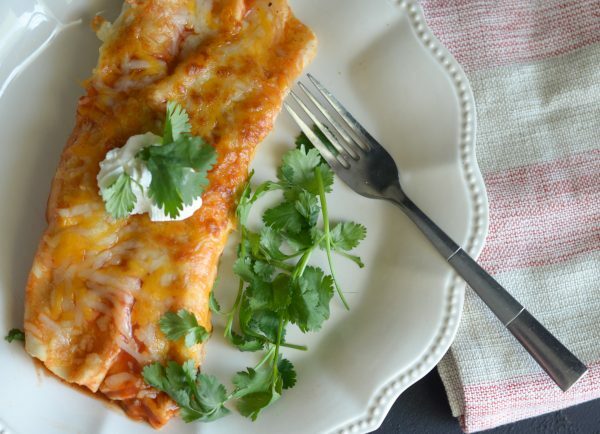 These Air Fryer Cheesy Beef Enchiladas are a great way to enjoy dinner tonight! 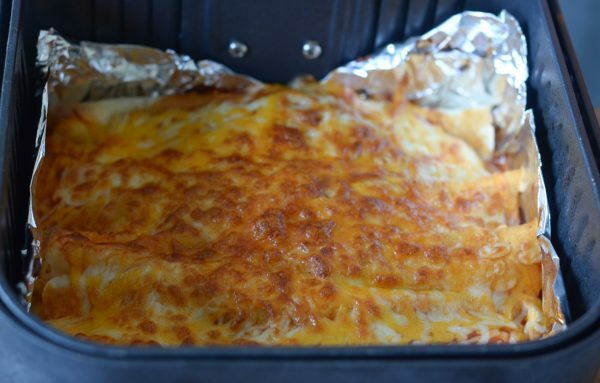 A few months back now, I whipped up these fabulous Air Fryer Cheesy Beef Enchiladas. The best part being that I was able to use Gluten Free Tortillas to make them gluten free too. 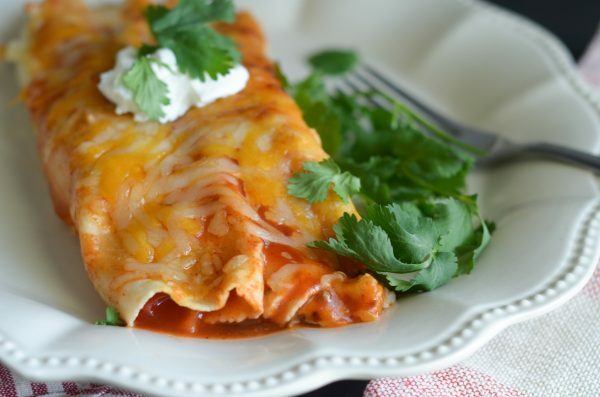 That’s right, they can easily be Gluten Free Air Fryer Cheesy Beef Enchiladas too. I’ve mentioned many times that I just love our Air Fryer. If you are looking to buy one, be sure to check out this post on how to choose the right air fryer first! Our air fryer is honestly getting to the point I am going to have to purchase a new one. I have used it THAT much! I love to warm up frozen foods in it too, just to avoid having to heat up the oven. I love that I can use the air fryer without having to preheat it too. 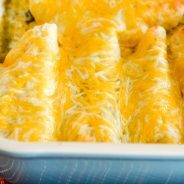 What is the best Gluten Free Tortilla for Gluten Free Air Fryer Cheesy Beef Enchiladas? 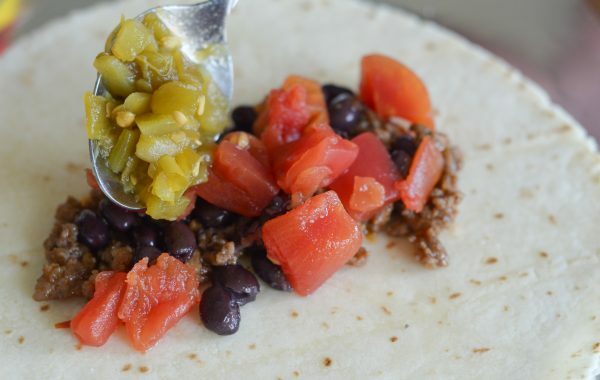 If you need gluten free, I’ve found these Gluten Free Mission Tortillas to be the best option. 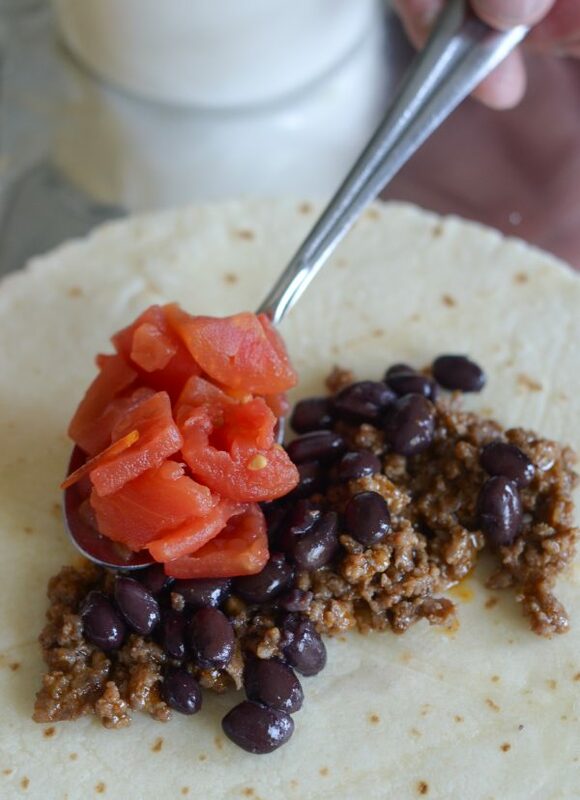 The other alternative is to use a White Corn Tortilla. I do suggest with either option, warming them up first to make them more pliable when preparing them. 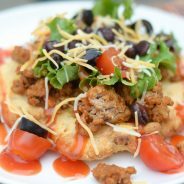 I used the Gluten Free Mission Tortillas for these that you see in the pictures in this post. 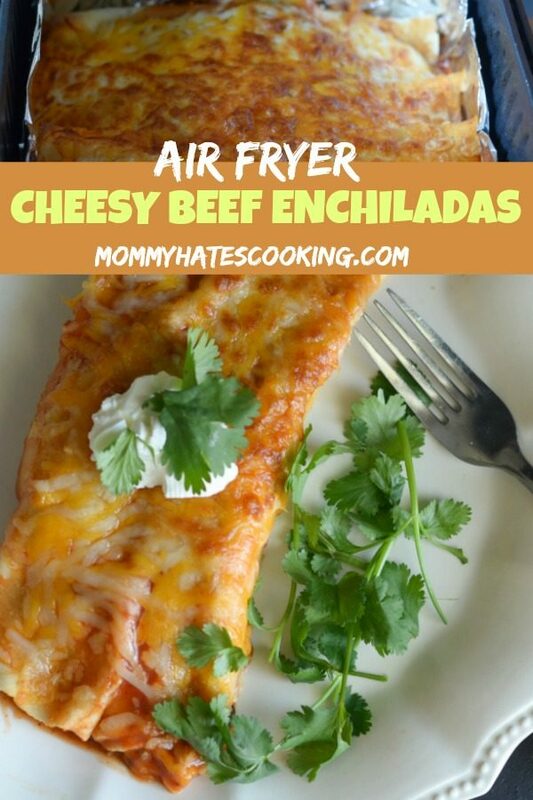 What do you need for Air Fryer Cheesy Beef Enchiladas? 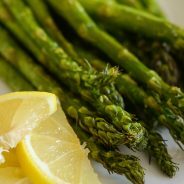 This meal is easy to complete from start to finish in less than 30 minutes, making it a great choice for a busy weeknight. If you want to make this even faster, do a batch cooking day where you cook the ground beef ahead of time and freeze it. 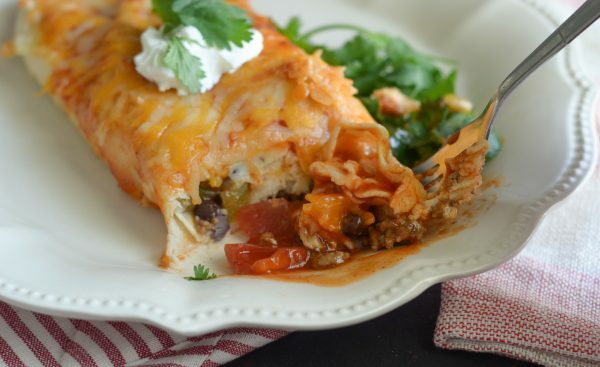 Once you are ready to make these, simply warm up the ground beef and prepare the enchiladas. Begin by browning the ground beef in a medium sized skillet. Add in the taco seasoning as instructed on the package. 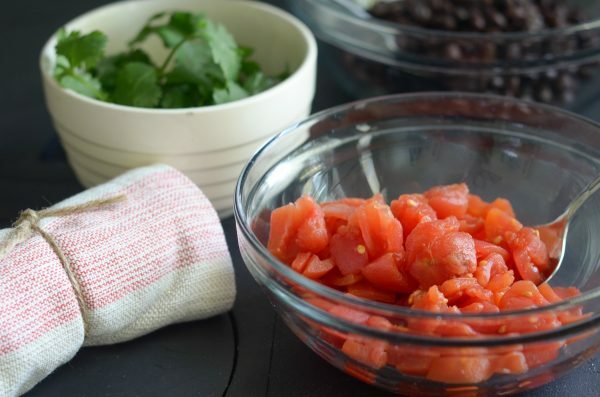 Build each tortilla by adding beef, beans, tomatoes, and chilies. Place each one inside the basket of the air fryer, if preferred; line the basket with foil first. 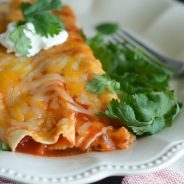 Once all the enchiladas are made, pour the enchilada sauce evenly over them. Evenly add the cheese on top. Cook on 355* for 5 Minutes in the Air Fryer. Carefully remove, add toppings, and serve. Depending on the size of your Air Fryer, it may be necessary to cook in 2 batches. Cook for an additional 1-2 minutes if cheese is not fully melted as all air fryer cook times vary just a bit.